How to Book a Yangtze Cruise at China Discovery? Choose your favorite cruise ship from our Ship Layout. Useful information as Yangtze cruise routes, updated cruise calendars are offered for reference. Submit inquiry on-line. You’ll receive the sample itinerary and quotation from our travel advisors within 23.5 hours. Discuss the details with your private travel advisor if you need any special order (like accommodation, local transfers, and flight in port cities). 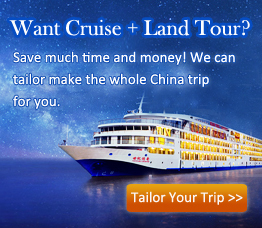 You can also customize an extended China Yangtze tour with us. Then, a detailed proposal and price can be done. Confirm acceptance and pay 50% deposit to us. Or pay in full if you can’t pay the balance no later than 30 days prior to your arrival date.The payment methods we accept include: PayPal, Credit Card, Western Union and Wire Transfer. Read more about our Payment Guide. Receive our final confirmation and tour voucher. They are not needed to get onboard. You just tell your name and show your passport to the receptionists when boarding the cruise. Well, the next thing is just to enjoy the sailing and go to see the world biggest Three Gorges Dam!